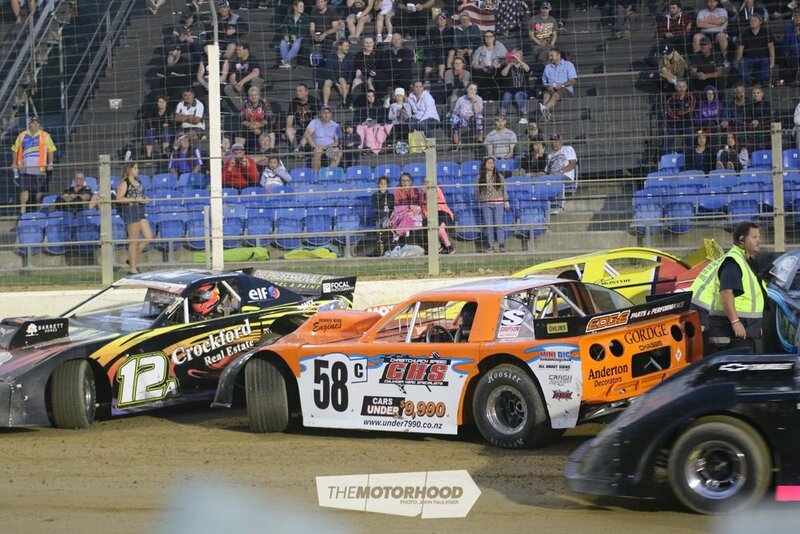 The 2018 Super Saloon GP, sponsored by The Moving Company, was held at the Max Motors Family Speedway in Wellington. 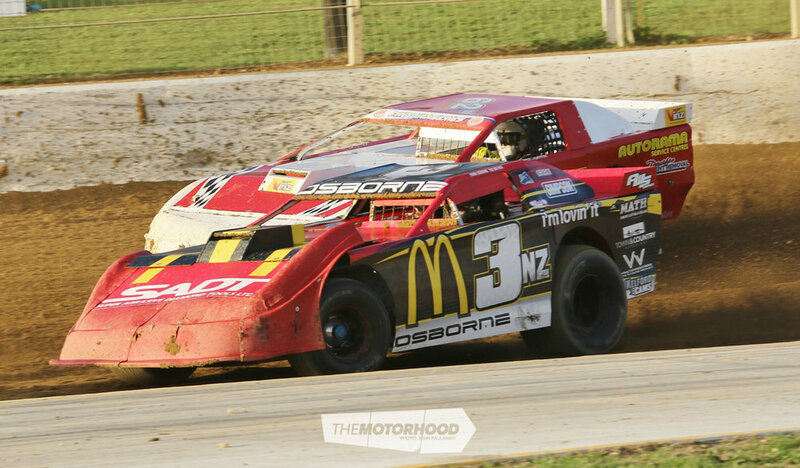 The weather on Saturday, January 20, was great, and with 18 cars entered from all over New Zealand, a great show was guaranteed. The New Zealand Champs had been held at ASB Baypark the previous week, so most of the South Island competitors had kept their cars in the North Island for this event. The biggest problem over the course of the event would turn out to be track conditions. After several races from other classes, small stones began flying into the spectators on the pit corner, and racing was temporarily stopped while the spectators found somewhere else to sit. The field was full of top contenders, including the new Super Saloon number one, Terry Corrin (1NZ). Unfortunately, after only a few laps, his car was put out of action for the rest of the meeting due to mechanical issues. The hard-charging contenders also included former number one, Peter Dickson (11E), and the new 3NZ, Mark Osborne — unfortunately, Osborne would be one whose battle for the top spot was cut short with gremlins ending his night in the third heat. The race format for the night was initially two heats of 12 laps, then a final of 20 laps, but at the drivers briefing it was changed to three 20-lap races with the highest points at the end being the winner — great for drivers and the crowd, with far more race time on offer. Heat one got off to a roaring start, with no major accidents, just few few minor fender benders and tyre issues, and six cars not finishing the race. Donald Gregory (21W) sat on pole and never looked back — racing on your home track definitely has its perks! He was followed by Ian Burson (21N) from Nelson, and Darryl Ainsley (5T), another South Island competitor. Heat two, and Shane McIntyre’s night was over before the first lap was even done, with a four-car pile up on turn two hitting Kirsten Vermeulen sustaining major frontal damage. It took a while to free the car, as it was stuck fast. Meanwhile, Mark Osborne was a man on a mission, battling hard with Peter Dickson. A bit of argy bargy saw Dickson take the win, with Osborne the runner up, and Dan Corrin (124) sitting in third. Going into the third heat, it was Ian Burson (21N) leading the points table, at 31 all up. He was followed closely by Dan Corrin and Mark Osborne, with 29 apiece, and Darryl Ainsley (5T) trailled by a whisker with 28 points. The hard-charging Osborne sustained damage and was out of action, while Wellington’s Mark Pitcher (9W) lead from start to finish — another home track favourite. Peter Dickson took second, followed by Ian Burson in third, who would wind up as the overall winner by six points. A three-way run off had to be held to decide the second and third placings, due to the neck-and-neck points standings between Darryl Ainsley, Dan Corrin, and Peter Dickson. When all was said and done, Dan Corrin took the win for second overall, with Peter Dickson claiming second for the third spot on the podium.